to the fifth generation Hiromasa. It dates to the Muromachi Era (16th century), 1492 (Mei-O). and the Teiryo Yogi on page 75. Muromachi period Soshu-den work is known as Sue-Soshu. 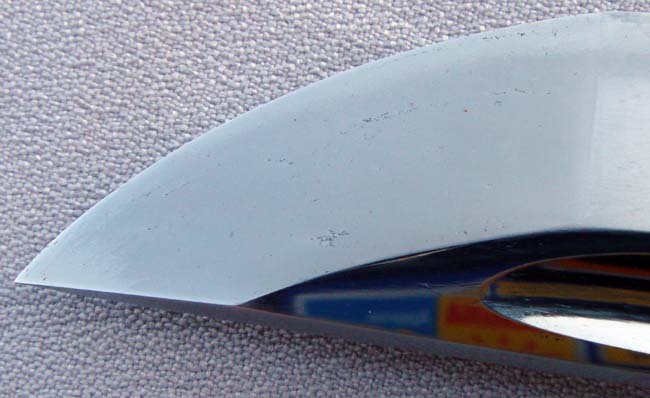 Blade length is shorter than in earlier periods. Nagasa is 58.5cm (23in.). Nakago is 16.25cm (6.4in.). 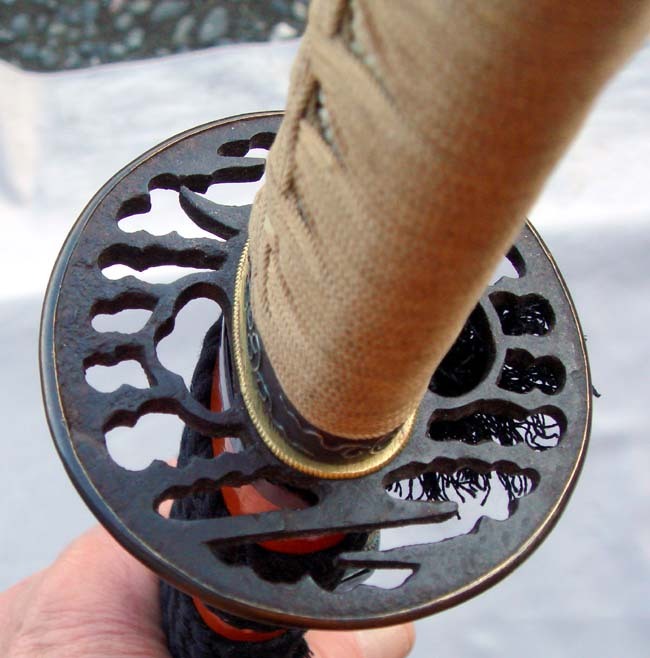 KATATE-UCHI: Read and compare "One Handed Fighting Sword", the predominant style of the Sengoku. Yamashiro Den by Masamune and Sadamune appears when viewing Hiromitsu and Akihiro. the fourth and fifth periods of this Kuni. the Sue Soshu was Tsunahiro of the Yamamura Ke. another city in Soshu province ruled by the Hojo clan. This group was called the Odawara Soshu, and was one of the Sue-Soshu schools. Masahiro, Hiromasa, and Sukehiro were swordsmiths and the descendants of this group. Read a study about Masamune and his school. This sword is accompanied with a new set of koshirae. 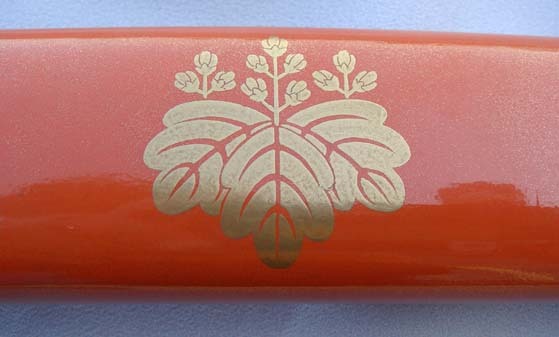 The Fuchi, Kashira, and Kojiri are all of shakudo with brass inlay of Kiku design. 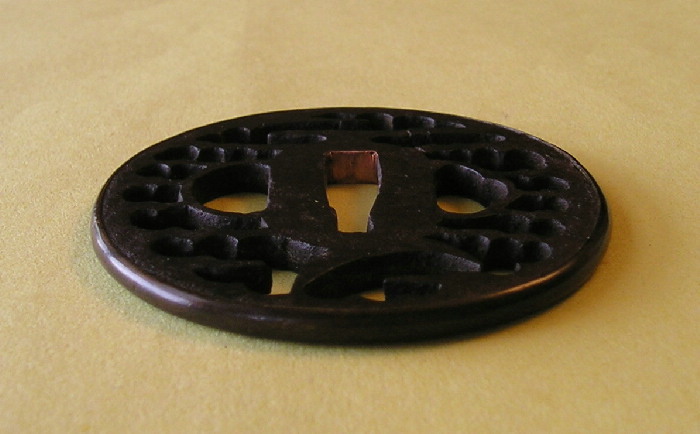 The Menuki are three symbols, each of silver, copper, and brass. 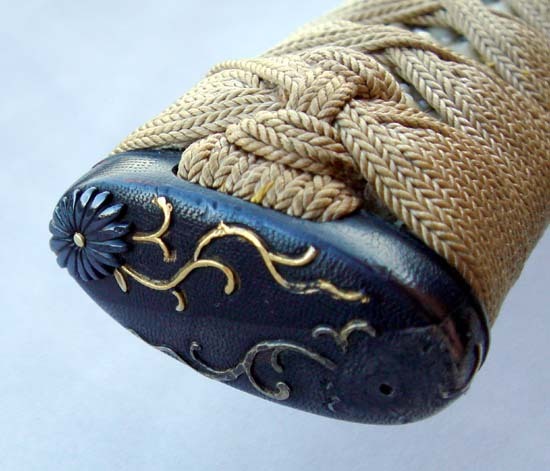 The Saya is laquered with inlay of Kiri-Mon (Paulownia) used by the ASHIKAGA and Toyotomi Hideyoshi. 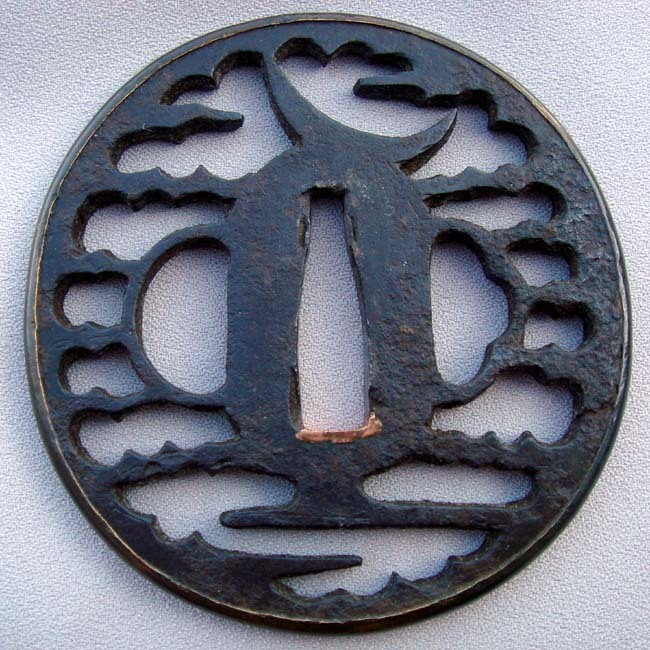 An excellant Echizen Akao Ji-Sukashi tsuba from early to mid 1600.
made of well forged tempered iron. 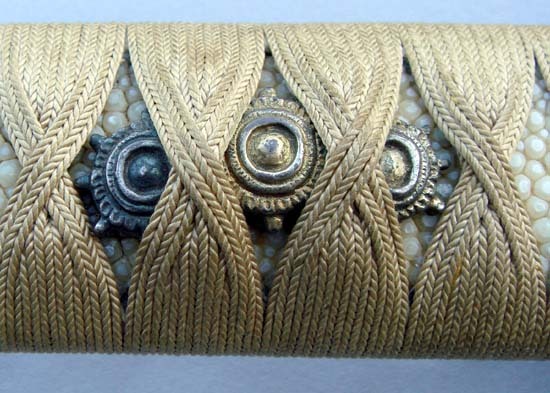 There is Sekigane of brass inserted in the Nakago-ana. Kozuka and Kogai ana are present. 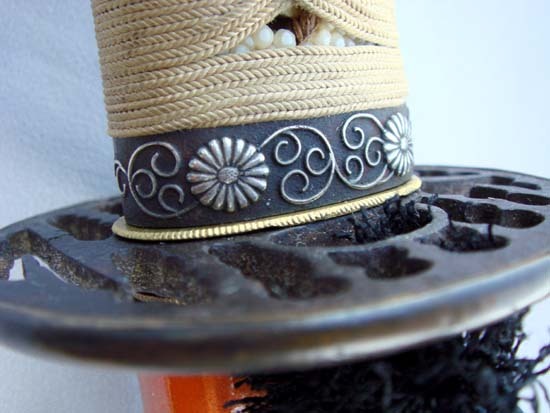 The Fukurin is made of Shakudo. The Ji-Sukashi design of a cresent moon and clouds over water. 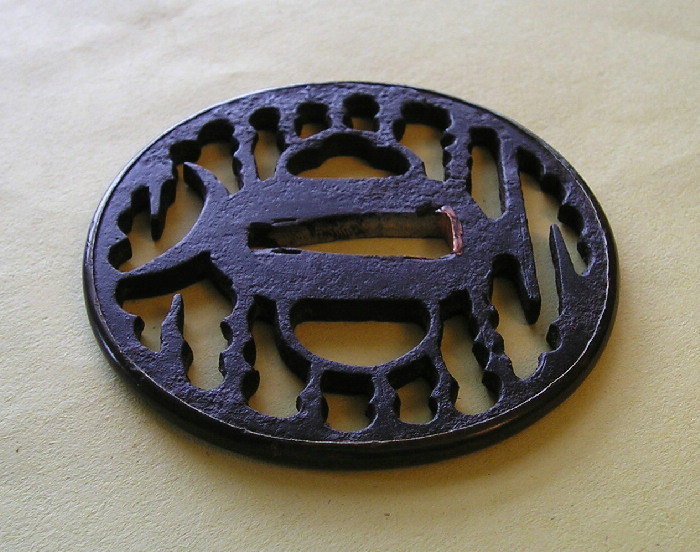 The tsuba and the Habaki are probably original with the blade prior to receiving new Koshirae. 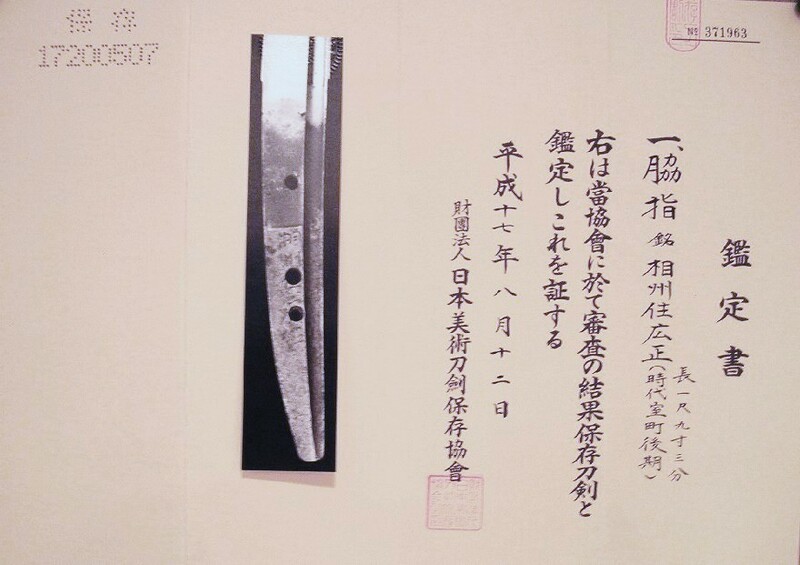 The blade shape is Torii-Sori. 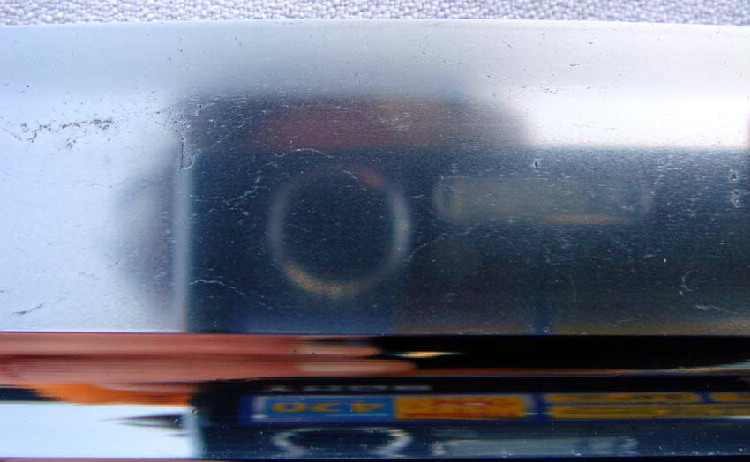 There are Bo-Hi on both sides of the blade that run off the end of the Nakago. to 'Soshu Ju Hiromasa', last of the Muromachi period. The Sue-Soshu school was inclined toward Suguha of Nioi Deki. Hitatsura which is mainly seen in the blades of the Soshu-den is not seen here. 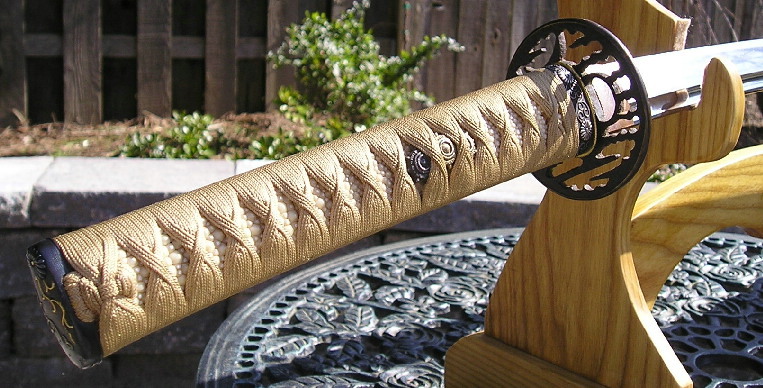 The Jihada is a very fine and compact Itame pattern. This Hamon is best described as a Soshu 'snow-storm' and the Habuchi is entwined with Ko-nie: however, it is Nioi based. The Boshi appears to be Sugu and tempered with a hint of brushing in the tip, with a Ko-maru and short Kaeri. Ubu Soshu nakago with three Mekugi-ana confirms the age of this Katate-uchi.